This TRANSITION AGREEMENT (the "Agreement") is made effective ___________, 20__, among PHARMACY BUYER, LLC, a _________ limited liability company (the "Buyer"), PHARMACY CORPORATION, INC., a _________ corporation (the "Company") and MR. PHARMACIST, an individual ("Owner Pharmacist" and together with the Company, jointly and severally, the "Seller"). WHEREAS, the Seller and the Buyer desire to foster a smooth transition of the Business from the Seller to the Buyer and, in the interests of facilitating such transition, the Buyer desires to use the Seller’s Licenses (as hereinafter defined) to operate the Business for a short period of time after the Closing Date, and the Seller is willing to allow the Buyer to use the Seller’s Licenses to operate the Business for a short period of time after the Closing Date, pursuant to the terms and conditions of this Agreement. 1. Definitions. Capitalized terms used and not defined herein shall have the meanings set forth in the Purchase Agreement. 2.6. The Seller’s bank accounts used for payments from insurance companies, Medicare, Medicaid and credit card services. To effect the foregoing authorization, on the Closing Date, the Seller will execute the Limited Power of Attorney in the form attached at Exhibit "A" authorizing the Buyer to act on the Seller’s behalf in connection with the Licenses, and other documents, if any, as may be required or requested by a government agency, including, without limitation, powers of attorney. 3. Termination of Right to Use Licenses. The Buyer’s right to use the Licenses will terminate upon the written notice of either party upon the earlier of: (a) the issuance to the Buyer of the same types of permits, licenses, registrations or certifications as the Licenses (the "Required Licenses"); or (b) sixty (60) days from the Closing Date; provided, in the event that the Buyer has not obtained the Required Licenses within the required time period, the term of this Agreement and the Power of Attorney will be extended by twenty (20) days if (i) the Buyer has not breached and is not in default of the terms of this Agreement, the Purchase Agreement or any document executed in connection therewith, and (ii) the Buyer is actively seeking and using best efforts to obtain the Required Licenses as promptly as possible. 4. Will Call Prescriptions. The company performing the Inventory will account for all orders at the Business for prescriptions placed but not paid for prior to the Time of Transfer ("Will Call Prescriptions") and determine the cash amount owed by customers for Will Call Prescriptions (the "Will Call Receivables"). On the Closing Date, the Buyer will pay the Seller the amount of the Will Call Receivables. All Will Call Receivables will be the property of the Buyer. All other receivables from third parties in connection with the Will Call Prescriptions will be the property of the Seller subject to paragraph 5 of this Agreement. 5. Third Party Receivables. All accounts receivable (whether billed or unbilled on the Closing Date) for prescriptions delivered or picked up prior to the Time of Transfer other than the Will Call Receivables (the "Seller Receivables"), will be the property of the Seller. The Buyer will collect the Seller Receivables on behalf of the Seller and furnish an accounting of all Seller Receivables (reconciled to the transaction generating such Seller Receivables) to the Seller on a monthly basis. The Buyer will pay the Seller all collected Seller Receivables on a weekly basis. The Buyer will conduct the foregoing collection, accounting and reconciliation at the Buyer’s expense. All accounts receivable generated after the Time of Transfer will be the property of the Buyer and the Seller agrees to promptly deliver to the Buyer any such receivables delivered to the Seller. 6. Consulting. 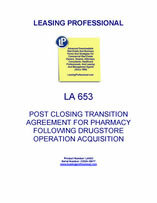 During the term of this Agreement, Owner Pharmacist agrees to provide information reasonably requested by the Buyer regarding the Seller’s and the Business’s operations, arrangements, policies and similar matters, regardless of whether Owner Pharmacist is employed by the Buyer or the Buyer’s agents or affiliates.